Which way do you lean when it comes to food preferences – sweet or salty? Given the choice, my go-to favourites have always been foods that are salty – and usually high in fat – with French fries and potato chips tied for #1 on my list. My mouth waters just thinking about them! Yet as someone who has struggled with weight problems for most of my adult life, overindulging in these calorie-laden treats on a regular basis can be counter-productive to my efforts at reaching and maintaining a healthy weight (which, incidentally, is a big reason why we’ve never owned a deep-fryer). So I was intrigued when I heard from a representative from T-fal Canada, who offered me the opportunity to gratify my desire for my favourite foods without thwarting my healthy living efforts – Win-Win! – by giving me a free ActiFry 2in1 to try for myself. The ActiFry 2in1 has a patented 2in1 function that enables you to cook two dishes at the same time – for example, fries or veggies with meat or fish – with an intuitive control panel to manage the two cooking areas and four programs to cook meat, fish, poultry, and even desserts. The unit has a cool touch body for safe and easy handling. The removable cooking pan and plate both feature an exclusive ceramic coating (so your food doesn’t stick! ), and the lid, stirring paddle, cooking pan, and plate are all removable and dishwasher safe (making cleanup quick and easy). But the VERY BEST part (at least as far as I’m concerned!) is that the ActiFry 2in1 uses only 1 spoon of oil (and a measuring spoon is included for perfect measurements of both oil and salt) to make 1.5kg of crispy fries. Seriously! My French fry dreams have all come true! We were impressed and inspired by the selection of 20 recipes for great meal ideas included in the box with our new ActiFry 2in1, and after browsing through the book’s full-colour pages (as well as the recipes on Nutritious and Delicious), we decided to try our hand at making some crispy chicken drumsticks with fries for our very first ActiFry 2in1 meal. 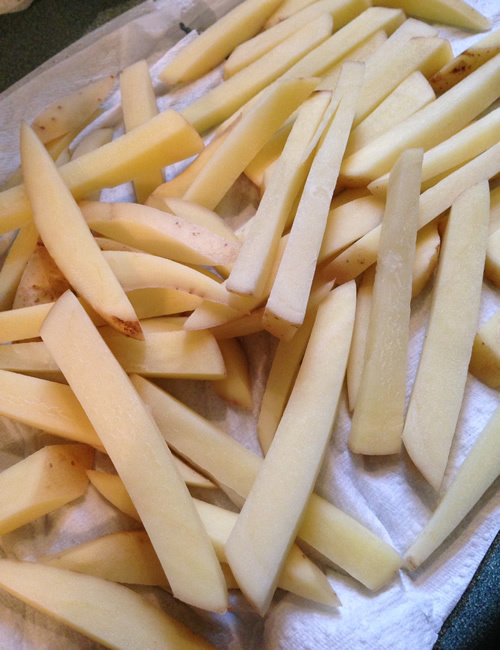 …and slicing a couple of potatoes (we used Yukon gold, as that’s what we had in the pantry) into fry-shaped pieces. Then we transferred the potatoes to the bowl of the ActiFry 2in1, drizzled them with a measured amount of olive oil, set the timer, and sat back to wait (with mouths watering – especially as the cooking smell began to filter through the house!). 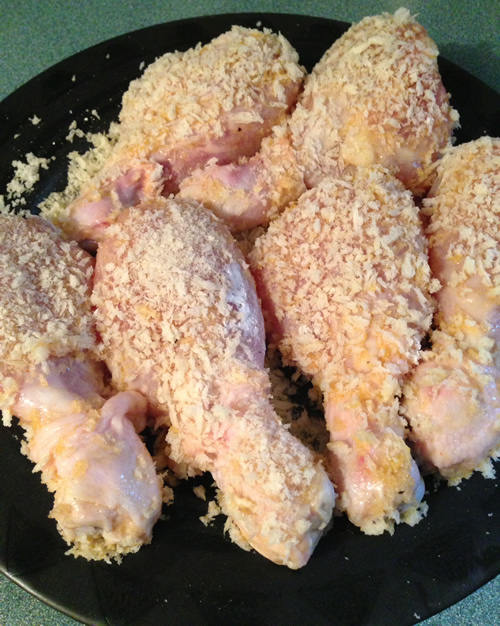 …and here’s the chicken, ready to begin cooking. While we hadn’t followed any of the recipes exactly (ours was a kind of mash-up between the one for chicken and the one for fish! ), we did use the cookbook as a reference for quantities and timing… so I think it says a lot about the ActiFry 2in1’s intuitive ease of use that our first meal turned out perfectly. The chicken was crisp on the outside and juicy on the inside. The fries were crisp and flavourful and, in spite of the fact that they were cooked without having been plunged into a vat of hot oil, they tasted exactly like REAL FRENCH FRIES. I would never have imagined that I could truly enjoy fries made with so little oil, but the ActiFry 2in1 has proven me wrong. 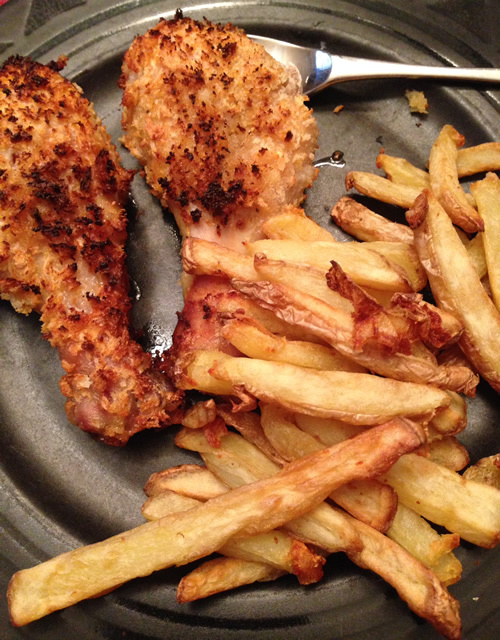 Since then we’ve used our ActiFry 2in1 for several further meals, and our enthusiasm about the product has broadened past just the prospect of healthy and tasty fries made at home (though I will confess that this is still MY favourite feature!). It’s easy to use – even for an inexperienced cook – and there’s no fussing involved (I mean, you don’t even have to turn the meat while it’s cooking!). The mess is minimal and contained (more so than cooking on the stovetop) and cleanup is a breeze. And the food you can make is delicious and fits easily into a healthy, balanced diet. So, want to experience the ActiFry 2in1 for yourself? It’s available from T-fal as well as the following locations (suggested retail price: $399.99). But in the meantime… guess what, Canadian readers? T-fal Canada is offering you the opportunity to win YOUR VERY OWN ActiFry 2in1… so I invite you to enter the giveaway, and wish you the best of luck! Got any questions about my experience with the ActiFry 2in1? Disclaimer: I received this product for free to review; however, all opinions are completely my own. It really is a wonderful little invention! This cooker looks amazing, especially because you’ve actually tried it. It’s pricey, but what isn’t these days, and if it works, it seems like it could make for healthier eating. Will have to look for one. I love how convenient it is. We had pork chops and sweet potato fries last night and it was all to die for! I’ve seen this in the stores so many times, but I’ve never read a review that focused on the one feature I care about the most- making french fries. If you’re impressed, I know I will be too! I have got to find this. I am a salty food addict. I would take that over chocolate any day! I love ff and potato chips better than ANYTHING. We didn’t buy a deep fryer when we moved to S.C. because we are trying to eat healthier. This would be perfect. My problem is also things that aren’t dishwasher safe. With my RA I struggle trying to clean up large appliances. This would be perfect on so many levels! This one is definitely easy to clean up. Even if you don’t have a dishwasher, the pieces are light and non-stick, so no real scrubbing involved. It’s a wonderful little appliance! Wow, it sounds like magic. It really seems that way! A huge hankering for french fries! and homefries! Shalini recently posted… Eternal Love..
Wow this is a dream machine that makes all my fav food I think! 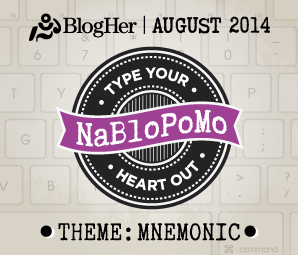 nabanita recently posted… I’m Blank Because…. How yummy is that! I think I saw this in an exhibition here and wondered how it was possible. I’d love one of those, Laurel! I can think of so many things to do with the ActiFry! And I love your review! Thank you, Vidya! It really is quite amazing how they manage it. So glad we have one! Even the slightly dry porkchops were delicious! 😉 I imagine they’ll taste phenomenal when done for the right amount of time. My mouth is watering just thinking about healthy fries made in it! LOL! I wish you’d been here last night instead when SOMEONE (ahem) actually read the directions properly and made porkchops the RIGHT way! They, along with a batch of garlic sweet potato fries, were amazing. Totally moist and flavourful, since we didn’t manage to kill them! We will have to have you over for a re-do! It really is! So glad we got one! I seen somebody else tweet your giveaway on twitter. 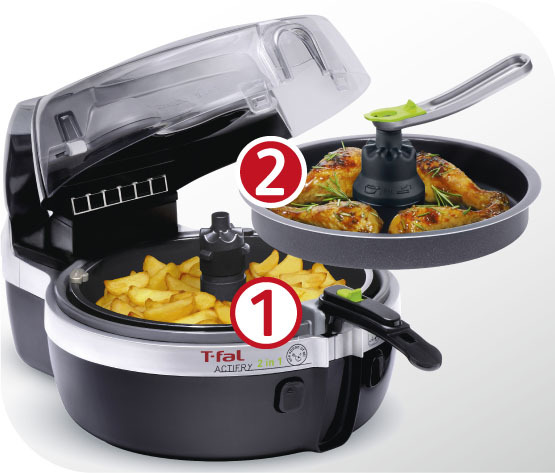 I would make french fries and chicken with the T-fal ActiFry 2in1. 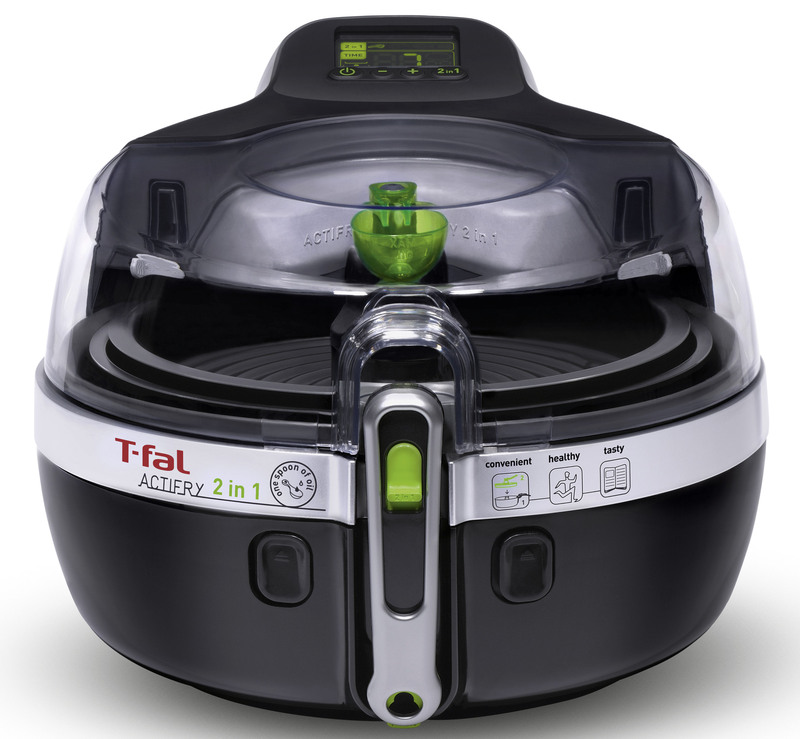 It would be great to win this T-fal ActiFry 2in1. 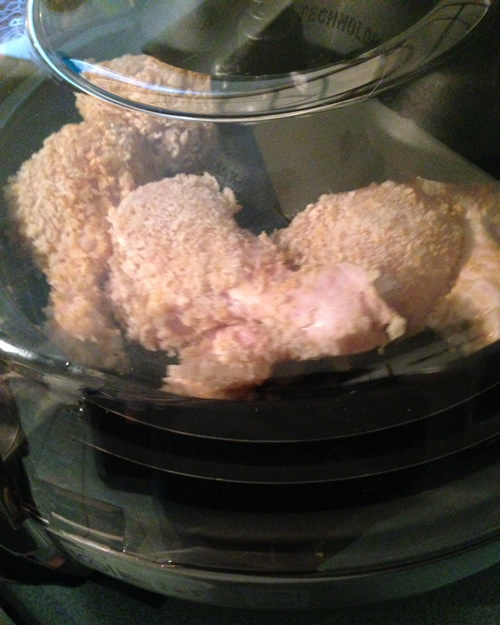 How did i find your blog, and what i would make with the T-fal ActiFry 2in1? and i would make French Fries and Fried Chicken. How do you get free products to review? Do you get to keep them? The food looks amazing. Thanks, Anne! Yes, I get to keep the products (yay!) in exchange for doing the review. I haven’t actually solicited any of the products I’ve reviewed, but have been contacted by product reps. Not sure how they found me in the beginning, but once you start working with someone and they get to know your writing style etc., I would imagine they’d keep you in mind for future reviews that they think would be a good fit. Found your blog on a Twitter post. Great Blog by the way! I would use this to make french fries…looks so yummy!!! Thanks, Doris! The fries were wonderful! They were first on my list too! We had those the other night and they were amazing! I found it on twitter! I would at first make french fries,,yum! I found your blog through twitter and subscribed. I would make fried zuccini sticks. Oh, that would be yummy! Great, and honest review. Making me think I should own one! Thanks, Lisa! It’s really an amazing little machine. Good luck! We had one of these. Just plain wore it out. The early versions had a plastic lid that was very brittle and eventually the stirrer paddle broke. But, OMG, the food it produced! Potato chips especially. Just a touch of oil, a bit of salt, a sprinkling of turmeric and they came out perfect. We have a replacement, a similar device from a different firm with a stirring blade that doesn’t work as well, and it’s a mainstay of my cooking. I just finished lunch, and it cooked up a perfect steak and eggs for me. Cannot recommend too highly for delicious, healthy cooking. This looks like such a great product…I love French fries but not the calories!! So perfect that you can cook two dishes at the same time! My husband had a heart attack last November so we are really conscious now of what we make for meals! Thanks for the chance! I found your blog through someone on twitter entering this contest! I shall be exploring more as well! I’d like to make french fries or yam fries!!!! I love them, but they don’t love me.. It would be nice for a healthier version! A healthier version is definitely better! Good luck! I found your blog via Twitter. 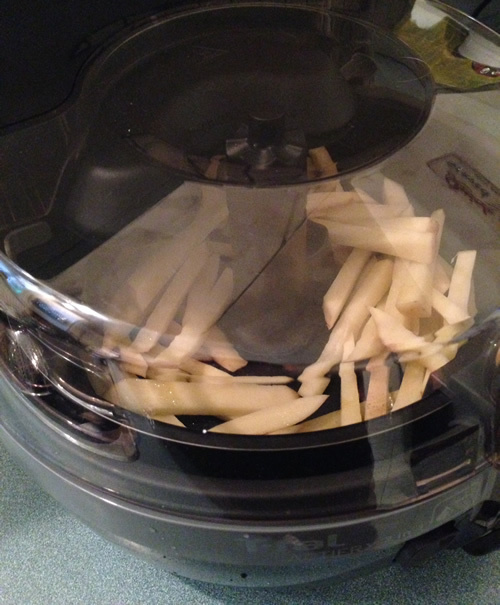 I would make french fries in the T-fal Actifry. well that was easier than i thought it would be! I would make fried chicken! I found your blog through tweets from a couple people I follow! I would make fries and chicken! I found your blog through twitter. Dare I dream of making healthier doughnuts using the T-fal Actifry? If not I would settle for much healthier fries. Oh, I wonder if that would work? Would be nice! I found it on twitter and I want to make sweet potato tempura! We had those the other night and they were great! It’s a great little appliance – lots of options! Might be my second time commenting because I don’t see my first. I found your blog on twitter. I’d make french fries and nuggets first. I want to try the fries! They look so good!!!!! I found it through a tweet about this contest and I’d make fries first thing! I found you on twitter from a follower .. I found you from a tweet I saw on twitter. I think the very first thing I’d make would be fries or sweet potato fries! Found your blog on Twitter. It really is a great choice. Good luck! Found you through Twitter. I would make french fries first! 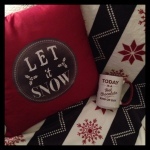 i found you blog thru twitter – somebody that i followed tweeted about this contest. Found you thru a friend on Twitter. I would make sweet potato fries for sure! Found your blog by following a friends tweet. I would totally make fried chicken! I came upon your site while looking up T-Fal Canada products. 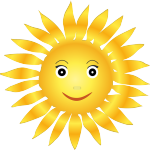 I have subscribed to your newsletter now and will be looking forward to coming to your blog more often. 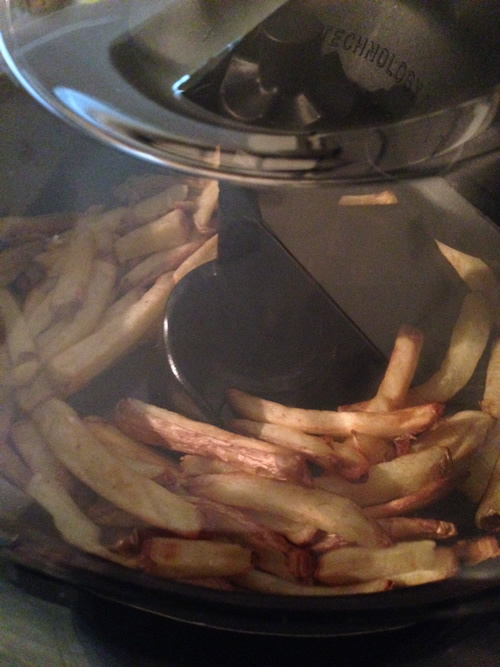 I’d love to use the ActiFry for making french fries! Nice to meet you, Bons! Good luck! I found it through my friend and I would make chicken wings! I found your blog on twitter! I would make fries first – I just HAVE to try them! I like that you can use the Actifry for so many other meals too! It’s a great little machine! Good luck!